Here at Camuso CPA, we offer a wide array of tax services for real estate investors including tax preparation and tax planning. If you are interested in how this might specifically benefit your business or portfolio, please don’t hesitate to reach out in detail today to schedule a free initial consultation regarding your specific facts and circumstances. The IRS can go back up to three years to prosecute cases of tax evasion, and in cases where they find substantial error, they can decide to go back up to six years or more. If you did not report your real estate transactions properly in prior years the best course of action is to file an amended tax return. When preparing your tax return, you are going to have to figure out your taxable income from your real estate investments for the year. This involves figuring out how much of your assets were sold for capital gains. Additionally, if you own rental properties you will have to determine the amount of taxable income to report from your portfolio. If doing real estate tax is proving to be a challenging feat, you should consider enlisting the services of a qualified CPA at a professional tax firm such as Camuso CPA. After preparing your amended tax return to reflect your real estate transactions they will be mailed to the IRS along with all applicable tax payments. 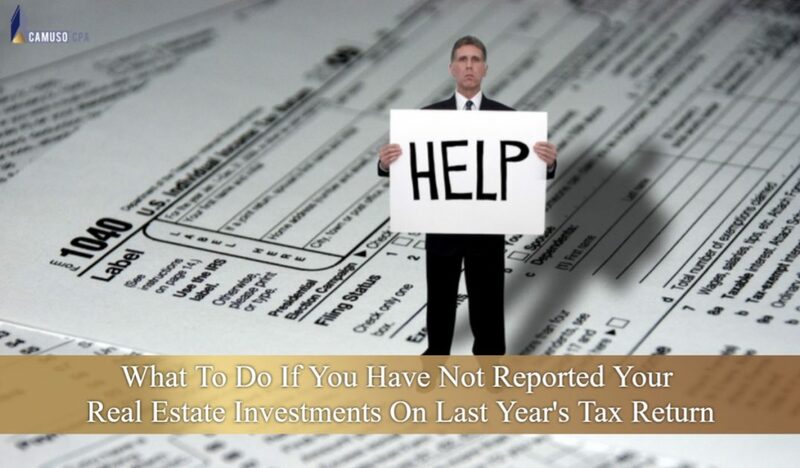 While paying taxes can at times be painful, it is very important that you include your real estate businesses and portfolio properly on your tax return. Ultimately, if you choose not to file your gains/losses and/or income, you will be committing blatant tax fraud to which the IRS can enforce a number of penalties, including criminal prosecution, five years in prison, along with a fine of up to $250,000. Here at Camuso CPA, we do have the ability to offer tax preparation and planning services to our real estate clients. If you are interested into how this might benefit your business or portfolio, please don’t hesitate to give us a call today. One of our friendly and knowledgeable representatives will be happy to answers any questions you have.